For many travelers, sampling local cuisine is as much a part of their travel experience as the destination itself. Thanks to our voraciousness for a deeper travel experience, food tours have exploded in recent years. That’s certainly the case in Charlotte. Food tours aren’t just for tourists. They’re an ideal way for locals to learn more about the history and culture of their own city. I’m a prime example. After living in the Charlotte area for over 20 years, I took my first local food tour just two years ago. I toured with FEAST Food Tours, and we ate our way through the thriving arts district of NoDa. Owner and guide Kristi Martin is amiable, well organized, and thorough. With extensive experience in the hospitality industry and a healthy knowledge of the goings on in Charlotte, Kristi is able to weave local history and interesting facts about the area and food spots FEAST Food Tours offers a varied selection of neighborhood food tours. Soul of the South Uptown, Dives to Dining Plaza Midwood and Chef-Driven Dining in Uptown are some examples. In addition, Kristi continues to hone each tour by adding new stops or crafting a new itinerary. This past Friday, my husband and I joined the Unwind & Dine in Historic South End tour. It’s from 4 p.m. to 7 p.m., and it’s a perfect way to kick off the weekend. We began our walking tour at the Vin Master, situated behind Luna’s Living Kitchen in Atherton Mill. We sampled a glass of Stoller Family Estate Pinot Noir Rosé while owner Rochelle Baxter shared all the great details behind this unique wine bar. Their ample, globally represented wine list features smaller, family-owned wineries. They also offer seasonal and local craft beers, as well as a healthy selection of locally made artisan cheeses, charcuterie and fresh from the farm dairy products. 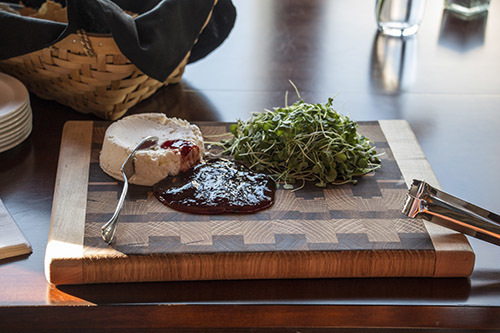 As we sipped and learned, we savored locally crafted ricotta cheese and black pepper crackers with an insanely delicious homemade strawberry lavender jam. We left the Vin Master and meandered down the Charlotte Rail Trail, a four-mile long urban trail that winds along the city’s light rail through the heart of downtown, to our next stop — Sycamore Brewing. We began with taste of our choosing. There were plenty of options, but I zeroed in on the Island Time Tropical Ale. It was like vacation in a glass. My husband tasted the Honey Trippel and it was delicious, too. We enjoyed a behind the scenes tour of the brewing process and learned how owners Justin and Sarah Brigham turned their passion for home brewing into one of Charlotte’s hottest craft breweries in a little over two years. With 28 taps and two to three new beers a week, it’s no wonder they have such a loyal following. On warm days, chill out at one of the many picnic tables. They often host live bands on weekends, too. You can grab a bite inside or choose from a happy train of food trucks parked in the lot outside. One of those food trucks, the Tin Kitchen, was our next diversion. It’s one of the original four food trucks that opened up in Charlotte in 2010 (of which only two remain). 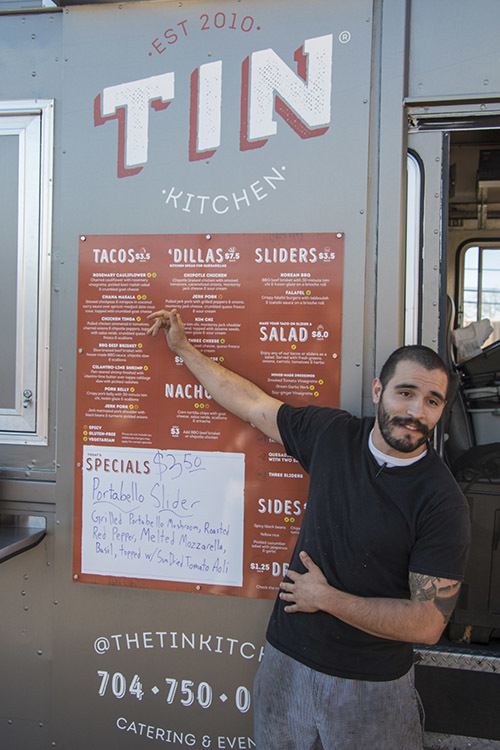 They’ve won a slew of awards and is one of only two area food trucks featured on Food Network’s Diners Drive-Ins and Dives (Papi Queso Food Truck is the other). Nachos, salads, sliders and tacos are on offer. We sampled the pork belly and chana masala tacos, which were on point. Honestly, though, I was distracted with awe at the 100% sanitation rating. But I’m weird like that. Bonterra Dining & Wine Room was where we headed next. Nestled in the heart of Dilworth, Bonterra makes its home in a renovated 110-year-old church. They boast more than 200 wines by the glass and another 300 from the private cellar (can I hear an “Amen!”?). You can dine on flatbreads, spreads and charcuterie at the bar, or enjoy selections from the oft-changing dinner menu. Fried green tomatoes, fried lobster tail, and wood roasted venison are a few options. All their steaks are prepared in a wood fired brick oven, which creates a unique flavor that puts them in the “one of the best steaks you’ll ever eat” category. When we arrived at Tupelo Honey Café, our next stop, we were greeted with their signature Blueberry Sage Kentucky Mule and a plate of their salivary gland inducing biscuits. Yes, please! I’ve eaten at Tupelo Honey Café several times — both their Asheville and Charlotte locations (they have locations in seven states!) — and I have never had a less than stellar experience. 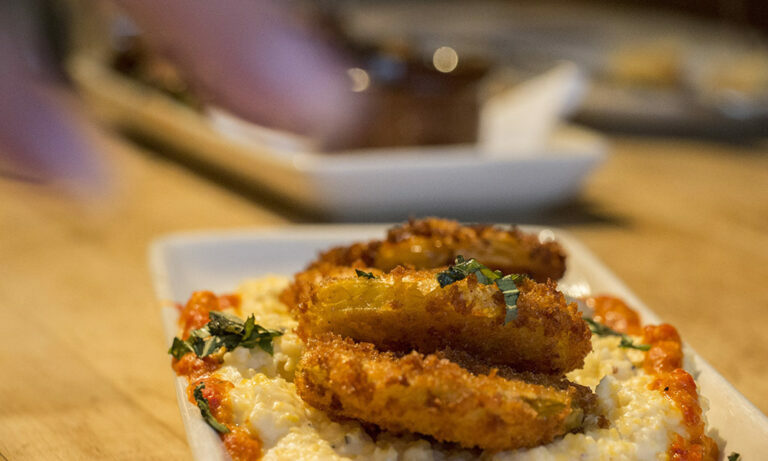 You can’t go wrong with their fried green tomatoes and their crispy Brussels sprouts (both of which we indulged in). Other favorites include their Grateful ‘Veg’ Burger, the Cast Iron Mac-N-Cheese and the Shoo Mercy Sweet Potato Pancake. Do you remember that great cover photo we had for our January/February issue of Go Magazine? That was the Shoo Mercy Pancake! We headed back to Atherton Mill for our final stop — dessert at Savory Spice Shop – South End. 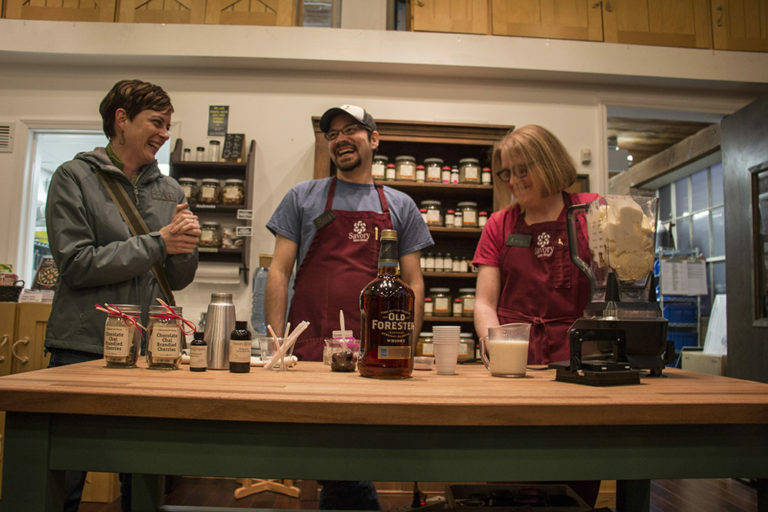 Owners Amy and Scott MacCabe crafted us an unbelievable Double Vanilla Bourbon Milkshake. Spices used to create this delicious concoction are available at their shop, which includes an impressive variety of gourmet spices and seasonings, recipes and beautifully curated gift sets. You can visit their brick and mortar location (which I highly recommend!) or shop online. FEAST Food Tour owner, Kristi, shared that the Unwind & Dine in Historic South End tour was actually inspired by the MacCabes. Thank you, Amy and Scott! 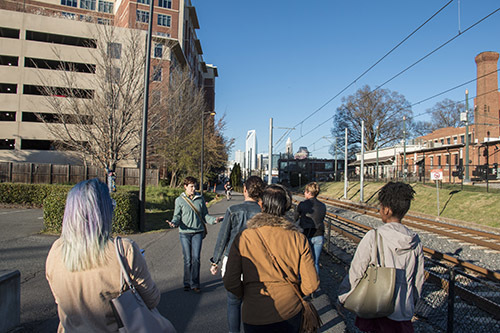 Whether you’re visiting Charlotte for the first time, as a return tourist, or just want to know more about your own hometown, a local food tour is a fantastic way to see the sites while getting a true taste of what makes this area so special. –Taste Carolina Food Tours offers tours in Raleigh, Durham, Chapel Hill/Carrboro, Hillsborough, Greensboro, Winston-Salem, and Wilmington. –Charleston Culinary Tours combines all the best of the Holy City’s food, drinks and history. –Eating Asheville hits the best and most popular restaurants in this fun and funky mountain town. –Columbia Food Tours guides you through this capital city one bite and a time.